February Tarot ⋆ Were The Cards Right? Time for some tarot reflection! I’m glad I’m doing this little series because it’s interesting to look back on. Others are finding it interesting as well because they can see for themselves if there’s anything to it. Let’s get into it! 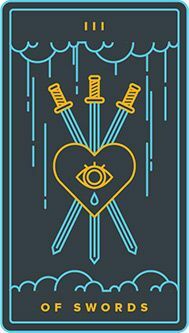 III of Swords is an image of grief, loss and literally heartbreak. This tarot card depicts separation or betrayal as well as the tragic emotions that come along with it. For example loneliness, abandonment or betrayal. The heart is a symbol of love, emotion and affection and what the swords represent vary from deck to deck. However, they usually indicate the power to harm, pain, and create suffering – such as words or logic. It’s the power to harm the physical and emotional side of a person. Upon reflection, I would say the tarot card drawn for me this month was pretty accurate. There seems to be a trend as January was also fitting. I was separated from my other half for the majority of February due to treatment needed to try and cure him of his illness. I was managing quite well until about a week ago when the pain and stress of being apart and at such a distance was becoming too much and my emotional strength was beginning to wain. We’ve been in this position before so I knew I could cope, but the stakes were a lot higher this time around and I put myself under too much strain to keep up appearances and take care of everything. I’ve mentioned before I seem to block out things that overwhelm me and usually, this is a defence mechanism that works quite. In this case, it bit me in the arse because I pushed myself too hard and had to recognise I was burnt out and needed some healing of my own. Fortunately, he is home now (yey!) and came back a few days short of my birthday. It was literally the best present I could have ever asked for! The weight lifted from me and I feel much better now he’s back. I appreciate this is still an uphill struggle and we are far from the end.. but I’d like to think the worst is over and the rest of it we can at least face together. Interesting. I’ve always been attracted to the tarot and like to see how people use the interpretation of various cards in their life.